I have spoken many times in public now. I always try to prepare well and to say what I believe God wants me to say. Sometimes I even deliver my talk out loud to the four walls of my study because I want to ensure I stick to my time limit. I know it won’t come out the same way on the day, but I always see something that needs changing and gain confidence in the process. But on two occasions recently, that confidence has been tested. At one meeting, I sat there listening as the MC introduced me. I felt excited about what I was to deliver. I believed God had guided me as I thought and prayed and organised my notes. But then I heard the MC give an overview of the content of my upcoming talk—and, to my horror, it sounded quite different from what I was about to share! What had happened? Had I misunderstood the topic I’d been given? I could feel my legs beginning to shake. I even debated about changing my talk then and there and speaking more along the lines this lady had indicated. After a brief whispered conversation with her, however, I was assured what I planned to say was fine—which I should have known, since I felt God had guided me throughout my preparation. Later, she apologised for making assumptions about my input rather than checking with me. And both of us acknowledged that the enemy had clearly had a hand in it all. Then recently, as we drove interstate for me to speak, with each kilometre we covered, I became less and less certain about the two talks I had prepared for a special women’s event. As I reflected on them and rehearsed them in my head, that old, niggling, self-doubt began to surface. What if we drove all this way and my input wasn’t even worth listening to? What if it was far too basic for the women who had given up a whole Saturday morning to be present? While God is speaking here to Zion, I am sure this verse was meant for me too. With such grace, even before I began my trip, God, the mighty Creator of our universe, was filling my heart and mind and mouth with his very words and guarding me with his own hand. Do you and I therefore have something of worth to say? Of course we do! If I have ever had any doubt about the capacity of human beings to copy others, it is rapidly being dispelled by our nineteen month old grandson. It behoves all around him to watch what they do and how they speak, because, just when you least expect it, our Zain will say and do the very same thing as you—in exactly the same manner and with the very same intonation! Several times recently while minding him, I have noticed how he copies my mannerisms—that shake of the head and slight frown as he says a very firm ‘No!’ or that lifting of both hands, palms up and open wide, as he agrees with me that his food is ‘all gone’! But all that pales into insignificance in the light of a sequence of events I observed last week when we were out together. It happened in a small play area at a local shopping centre. A little girl was playing on the tiny slippery dip there—although I use the word ‘playing’ loosely. She was in fact sitting on the highest point of the slide, completely blocking any other child’s access, with her arm out straight and her hand very definitely commanding everyone to stop. She was also scowling ferociously, warning other children off with a very authoritative ‘Nooo!’ And if any ventured too close, she would quickly add loud crying to her repertoire! However many times this little girl’s mother told her to move, these instructions were ignored. I was gobsmacked! The whole sequence of events he had observed took only a few moments all up—but that had obviously been long enough for him to take on board an apparently very desirable way of behaving. I had thought he was just innocently observing, when all the time, he was plotting how to use the same method this little girl had employed to his own advantage! Of course, Nanna quickly intervened and nipped these plans in the bud. Now that’s the sort of imitating worth putting into practice, don’t you think? I was taught a big lesson one evening at our old church. I should never have had to learn it in the first place—I should have known better. But the way it happened has ensured I will never forget what I discovered about myself that evening. Our service had finished and people were beginning to disperse. As I walked from the chapel itself towards our hall, I saw a man sitting at the rear on the old gas heater we used at that time. This man—let’s call him Alan—was known to us from previous visits to our church. Alan would tend to wander in late, smelling strongly of alcohol, and sit at the back, staring around with bloodshot eyes. I always kept my distance from him. And this particular night, I realised he could see that. In fact, he could see right through me, I discovered. As I walked past him, I must have given him a less than friendly look, because the next moment, I heard him saying something to me. At first, I had trouble taking in what he had said. I stopped and turned, already feeling embarrassed. ‘You don’t like me, do you?’ he repeated, looking straight at me in a way that gave me no escape. I walked on, without even giving him the courtesy of a response. I sensed he was laughing at my discomfort—and rightly so, I began to realise. You see, he was right. I didn’t like him. In fact, I despised him for the way he lived his life. Yet I knew nothing about him. I had never bothered to try to find out what his background was like, what had caused him to drink so much, what issues he had faced, what opportunities he had missed out on. Others did chat to him and try to help him—but all I had done was judge him. And Alan could see that clearly. Fast forward many years to the present. This time I sat while someone shared with me how broken-hearted she felt at the things she had done. As I listened, I found myself feeling just that bit angry with her—and a little self-righteous too. How could she have done those things I would never have done? How could she have let herself and others down like that? Yes, we could both see some answers to her first question. But as to the second, there is no real reason, is there, except that God loves us so completely—enough to forgive us over and over again as we come with contrite, broken hearts. If I felt aghast at what I heard, how much more must God be offended by the things we all choose to do? Yet time and time again, God forgives, God restores, God takes our punishment away—because of Jesus and the price he paid to set us free. Now that blows my mind. How about you? This past Sunday, our family celebrated not only Fathers’ Day but also the official release of my sixth novel, The Inheritance! Now you might well think I’d be used to all that goes with such events by Novel Number Six. I myself thought I would merely take it in my stride—but no! Not this time. As those copies begin to appear in the bookstores, I find myself holding my breath just a tad yet again. You see, I know this new novel is a little different from my previous ones. For starters, it feature two main characters of equal importance—and that’s something new for me. The Inheritance explores Michael Trevelyan’s struggle to come to grips with the past, be reconciled with himself, his family and ultimately God, and face the future with courage and integrity. But it also explores Alexandra Hope’s struggle to stay true to her faith in God and pursue God’s purposes for her life. It was quite a balancing act at times to put myself in the ‘head’ of one and then of the other, trying to react as each one might in a given situation. Yet while it was challenging, it was also great fun—especially when Michael chose to be very angry, arrogant and bitter all at once! I hope I have done both him and Alexandra justice. After all, they are real people—aren’t they?! I feel too I have incorporated more suspense into the story this time around, although it is hard for me to judge this aspect of my own novels. As I wrote, at times I didn’t even know myself what twists and turns my main characters would experience in their lives or how things would turn out for some of my minor characters either. Yet, while the story might have captured and held my interest, will it do the same for my readers? Finally, I believe the central theme of this novel is so important for us all to take to heart. I have attempted to convey clearly in The Inheritance how anger, bitterness, hypocrisy and pretence can have such an adverse effect in our own lives, as well as in the lives of others, and keep us from experiencing God’s amazing grace. As I wrote, the words of Hebrews 12:15 were very much in the forefront of my mind: See to it that no one misses the grace of God and that no bitter root grows up to cause trouble and defile many. I felt responsible writing about such a significant issue and did not want to trivialise it in any way. And I hope and pray God uses this story to touch readers’ hearts and enable them to experience more and more of that amazing grace of God. So for me, another new and fresh adventure begins, as I journey with my latest creation, The Inheritance. Again, I am so thankful to God that yet another of my stories has seen the light of day, courtesy of my new publisher, Even Before Publishing. 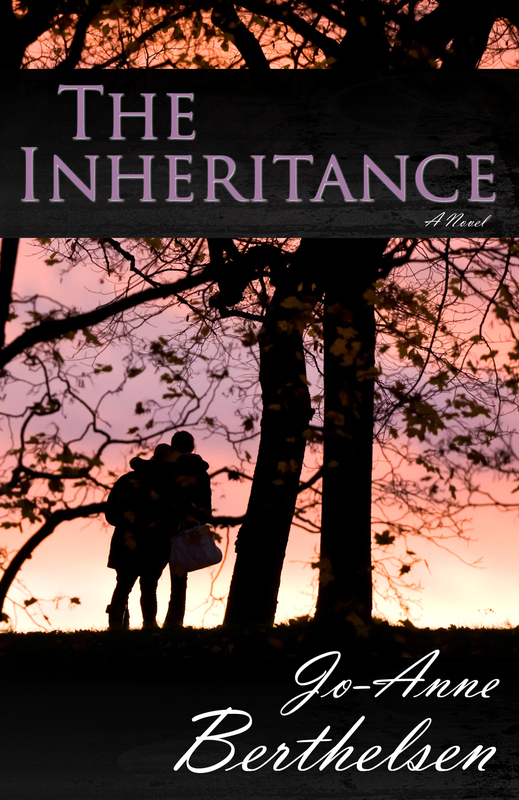 If you would like to check out The Inheritance, it is now available not only in hard copy via my website, www.jo-anneberthelsen.com, and my publisher’s website, www.evenbeforepublishing.com, or in Christian bookstores but also as an e-book for Kindle on Amazon or for other devices via the bookstores.